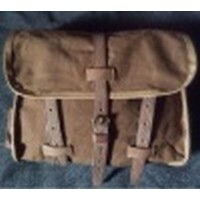 like the other ww1 webbing this is great quality at a good price. Perfect! Exactly what we were hoping it would be. Great repro - fast delivery. The weave, color and material is first rate. Looks exactly like originals I have seen photos of, including the dye striping. Very well done. Nice pack looks just like the original. This is a great little bag. The material is prefect. We added a single brace for a shoulder strap and stenciled the word CARTRIDGES on the flap to keep spare blanks and cleaning supplies in (duplicating an original pack we saw photos of). Great addition to our fire trench. Many thanks! Nice product as always. Thank you. I am happy with the pack and it seems to be what I expected. Both the colour and weave count match actual webbing artefacts I possess. Is the slight streaking of the dyed strands authentic? I cut back the stitching on the small buckles at the bottom of the pack to improve the lead to the diagonal 1 inch webbing from my ammunition pouches. I'm curious to see an original pack someday to see if my change is correct. Amazing delivery speed. Thanks. Good item, well made. Buckels on lower pack do dig in a bit. Well made item, and a fine addition to my kit.